Home » Which Solar Panels are Made in the USA? So Many Solar Panels – How Do You Choose? Does It Matter Where Solar Panels Come From? Selecting a solar panel model is not an easy task because there are hundreds of solar panel manufacturers available in the market. Therefore, to make the best decision, we must apply filters to make our choice wiser. Some homeowners or designers may be familiar with a particular brand and only select solar panels from that manufacturer. Others may select solar panels according to their efficiency values. However, some American homeowners or designers may opt to select solar panels according to their country of manufacture. 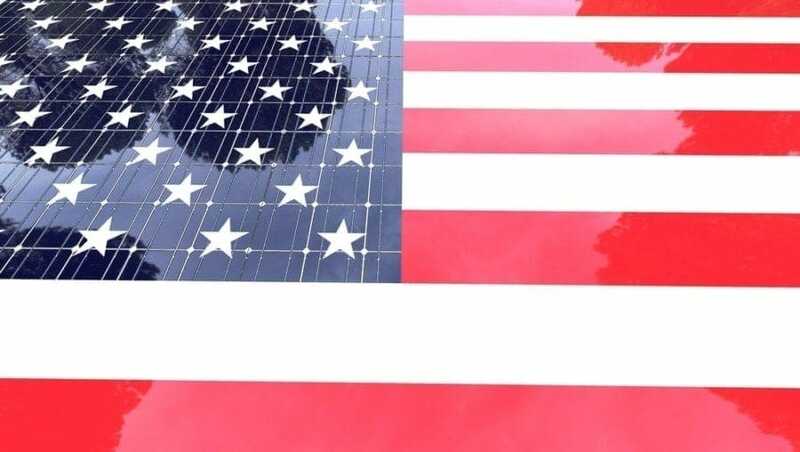 Whether it be for patriotism or for trust in American quality, many people in the American market choose to install solar panels that are made in the USA. If you think about it, your solar panels should last at least 25 years, therefore quality is a good thing base your decision on. Besides, an additional recent event can increase the interest in American made solar panels. In January 2018, President Donald Trump announced a 30% tariff for foreign solar panels imported into the USA. The announcement came into effect in February and will drop 5% each year down to 15% in 2022, time from which it will remain at 15%. Whether you agree with this decision or not, the truth is that in the next few years solar panels made in foreign lands will have to increase their value in order to compensate for the tariff imposed by Trump administration. This will present an opportunity for American manufacturers to step up in the line since they will be more competitive than ever. To give you an idea of the top American brands that manufacture their solar panels in the USA, we have prepared this list for you with some of their best solar panel options. Enjoy it! Maybe one of the most remarkable American manufacturers of solar panels with manufacturing facilities in Minnesota, Heliene solar panels are eligible for the Minnesota Solar Incentive Program. They are dedicated to homeowners that install solar panels made in Minnesota. Their most amazing solar panel is the monocrystalline 96 cell model with a power output of 490 Wp (unique in the solar industry) and a maximum efficiency value that rises up to 19.1%. Truly a premier solar panel made with American muscle. Mission Solar is based in San Antonio, Texas. Their solar panels comply with IEC and UL standards related to withstanding environments with harsh snow, wind, and salty conditions. Their production process guarantees high-quality solar panels that must pass through several technical revisions. Maybe their most remarkable solar panel is the 72-cell monocrystalline PERC cell model, with a power output of up to 365 Wp and efficiency close to 18.46 %. Silfab Solar is a company with 35 years of experience in the manufacturing of solar panels. The company operates in Bellingham, Washington with 158,000 sq.ft dedicated for facilities of automated production lines that design PV modules specifically for the American market. The company has recently announced their new set of astonishing solar panels that will be available in 2019. First, we have the 60-cell SLA-MWT 320Wp Monocrystalline solar panel with 20% module efficiency, 30-year linear power performance guarantee, and a beautiful dark black design! There is also the 120-cell monocrystalline SLA-M-HC-320 module that integrates half cell technology, PID resistance for high PV string voltages, and an efficiency of 20%! The company also integrates bifacial PV modules into their repertoire. Models like the SLG-X Bifacial solar panel with 360Wp in the front side could achieve up to 450 Wp if combined with both front and rear sides for power production. Besides, rear side power production can contribute up to 30% with an amazing 85% bifaciality factor, integrated with PID resistance, and an incredible performance against LID losses (reductions from 3% annual losses to 0.3%!). Definitely a premier jewel of the solar panel industry. Finally, in 2018 Silfab Solar expanded its operations in the US market by acquiring Itek Energy (another important US solar panel manufacturer). Solaria is a company with over 18 years of experience that manufactures its products in California and South Korea. The company is among the top solar panel manufacturers with efficiency values that can reach up to 19.9% efficiency. The premier product of the brand is the Solaria Power XT 360. 100% American company headquartered in Houston, Texas with manufacturing facilities in Jackson, Mississippi. Seraphim offers monocrystalline and polycrystalline solutions to the PV market. Their products offer quality performance against salt mist and ammonia corrosion, PID durability tests, and top rank among Photon Lab’s yield measurement tests. Their top solar panel is the SRP-6MA model. The only solar panel manufacturer in the State of Florida. Established in 2012 with manufacturing facilities in Riviera Beach. The company promotes their own original EPIQ technology that combines PERC cell, heterojunction cell, and smart wire (no busbars to collect electrons) technology into a single design that promises high energy performance. Their top product is the EPIC 325W HJT model based on heterojunction cells, smart wire technology, 19.9% efficiency, and 30 years of guaranteed performance. Solar Tech innovation in the manufacturing process is something worthy of admiring and you can check it here. Suniva is headquartered in Atlanta with manufacturing facilities in Georgia and Michigan. The company has earned the right to be among the Top 50 fastest growing companies in Atlanta along with other prizes such as Georgia Manufacturer of the Year and Renewable Energy Exporter of the Year. Their product is based on Suniva’s ARTisun Star technology offering monocrystalline and polycrystalline options to the American market. We have examined some of the most remarkable solar panels made in the USA, however, you may find other brands such as SunSpark, Kyocera Solar, Centro Solar America, Mage Solar, and Zebra Energy, that also manufacture their solar panels inside the US. Quality of US manufactured products is generally indisputable. However, that does not mean that you cannot find premier and high-quality modules that are manufactured outside the US. For example, Sunpower has its headquarters inside the US but manufactures in China and the Philippines, and they have been the worldwide top brand for several years. Jinko Solar, LG, and Trina Solar are other examples of high quality standard solar panels that are not manufactured inside the US. If you opt for US solar panels due to patriotic reasons then that’s perfect! But if not, do some research to find a balance between quality, design, and costs!